Over the summer (yes, the summer “vacation” that teachers get) my co-teacher and I took a well-known in-school special education program and developed it into a whole new thing. She and I have been working together for the past 5 years, and we were both hired to work in a new school for this year, in an already established program. What we came up with takes a little bit from where we used to work, and mixes it with some new concepts. Demonstrate and foster compassion, respect, responsibility, and integrity. Work cooperatively and collaboratively with peers and adults within the school and greater community to support academic, personal, and social development. Make decisions that will positively influence social, emotional, and physical health and well-being. Understand and exhibit citizenship in order to be a contributing member of a democracy and of a global community. Respect 3.3 Students demonstrate respect for themselves and others. Teamwork 3.10 Students perform effectively on teams that set and achieve goals, conduct investigations, solve problems, and create solutions (e.g., by using consensus-building and cooperation to work toward group decisions). Interactions 3.11 Students interact respectfully with others, including those with whom they have differences. Conflict Resolution 3.12 Students use systematic and collaborative problem-solving processes, including mediation, to negotiate and resolve conflicts. Dependability and Productivity 3.14 Students demonstrate dependability, productivity, and initiative. This is evident when students: a. Attend school on a regular basis; b. Complete assignments on schedule; and c. Participate in classroom and group discussions. Taking Risks 2.8 Students demonstrate a willingness to take risks in order to learn. Persevering 2.9 Students persevere in the face of challenges and obstacles. The SOL Program is committed to creating a classroom environment that is built on the principles of being safe, respectful, and productive. By creating an environment that values each student as an individual and as a collective member of the classroom community, we are helping students achieve mastery in the skills and knowledge that are essential to becoming empowered citizens of a diverse and ever-changing world. What took even longer was developing scales which we and our students will use to rate our three core areas. We plan on using our behavioral data to be 10 or 20% of a student’s grade in the core areas we teach (that hasn’t been fully decided yet). While we want the students to earn their grades through academics, we strongly feel that behavior plays a role as well–as it does in life. Think about the people who get job promotions: they are the ones leading others or putting in extra time and effort; they are the ones with good social skills–so using behavioral data as part of a student’s grade is realistic. We also plan on doing standards based grading–which also took a chunk of time to develop. We have a 4 point grading scale; students will rate themselves, but we will also rate how well they meet the standards for each skill within the projects we do in class. Our rating scale transfers to letter grades (since our school still uses that system for transcripts). We still have work to do to further develop our rating scales (and I’m sure there will be much tweaking), but we have a great start and we will be ready to work with students in two weeks when school begins. My co-teacher and I will be teaching special education students who are in our alternative classroom for part of the school day. Since we will be using Common Core standards, we felt that it would be important to put those standards into language that the students can understand, that way they can learn to evaluate themselves using concrete criteria. We want to move away from letter grades and move toward standards-based grading and having the Common Core in language students and parents can understand is an important first step for that. Curriculum Area/Topic: Current Events topic related to the Olympics for a 10th grade literacy class with small group instruction. Instructional Strategy: The Creative Debate strategy allows students to practice their social skills (working together, giving feedback to peers) and it allows them to practice speaking skills (making eye contact, choosing appropriate language, speaking in front of people). Students are also, of course, working toward meeting Common Core Standards (which aren’t written for special education students who are below grade level like mine, but that’s another conversation entirely). This reflection strategy is useful because it gives students more realistic practice in an important life skill: supporting opinions with facts. Most of my students like to say “because” when asked “why”; I prefer that they learn to give good reasons based on facts and understanding. Students will find evidence from the text which supports their side of the issue. Students will write a brief summary stating their side of the issue; the summary will contain clear, concise writing with logical and supporting evidence, and it will contain proper grammar, usage and mechanics. Students will present their side of the debate in front of a class using clear, concise and logical information. Prerequisites: Students should already be familiar with the 2 articles and their subject matter due to class work and discussion in previous classes including vocabulary work, main idea/topic work, and gathering supporting details for a class summary of the articles. Tell students that it is now time to prepare for and debate a major issue set forth in the Vladimir Putin article. Give them the debate sides: Russia wasted money on the Olympics, or The money Russia spent will help bring an economic boom to the economy. Tell them which side they will defend and organize the students into two teams. Go over the grading rubric for the debate. Students will review the information they already have and they will find information that supports their side of the debate and enter it into their debate preparation graphic organizers. Students will work as a group to find information, but will each complete their own graphic organizers. For students who need extra support, teachers can scribe. The teachers should circulate and check-in with teams to make sure they are getting enough relevant information to support their topic and that they are adequately summarizing it. This part of the lesson will likely take an entire class period. Allow time for practice (each team in a separate space working with a teacher). Students can adjust their debate points based on teacher feedback. Steps 5+6 will likely take another whole class period to prepare. Once the debate is completed, the audience will each complete a scoring rubric. Students will write a brief summary of their side of the issue in a well-written short essay that has proper grammar, usage and mechanics (homework). Students who wish to complete “make-up” work (because they have been absent) or who wish to earn extra credit can do a write up for the opposing side. The students will be assessed based on completion of the scoring rubric by the audience. The teacher will also have completed a scoring rubric during the presentation. The students will also be assessed on their short writing piece (whether their arguments were logical and well supported as well as for proper English conventions of writing). Service learning with middle school students in special education can be a challenge. I teach in a school with 100% free and reduced lunch students and all of my students have significant emotional and behavioral challenges. They always ask me before I take them out to do community service, “why do we have to do this?” I tell them because it is a privilege for the taxpayers to provide them this special school to attend so they should help the community in return. That is usually enough of an explanation for them. They have a hard time focusing and staying on task, but when they get outside they become decent helpers. I know that this is also the beginning of teaching them a work ethic, persistence, initiative, and cooperation. 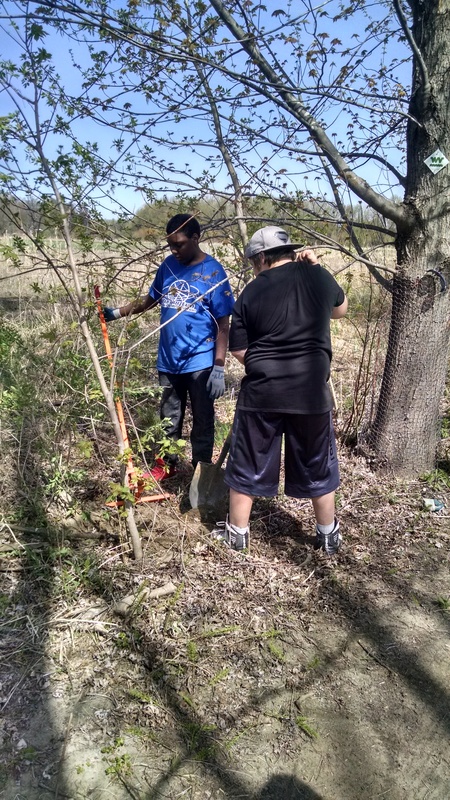 2 students dig out an invasive tree. The skills students learn from participating in community service are not the kinds of skills that get assessed on tests, and they are not skills that are part of the Common Core, but they are skills that are necessary for getting along well in the adult world and keeping a job.